A friend and I set off along the coast, heading West from Rosehearty, having read several conflicting accounts of the exact location of the cave. We knew it had been blown up by the home guard in WW2 and the lower entrance made inaccessible. Perhaps the best we would be able to say was that we’d walked near it? We passed lines of white quartz and rocky plateaus and many craggy cliffs where we stopped and wondered: is this it? Then: yes! We knew we’d found the place. Seagulls flew up, angry about us being so close to their nests, but down we went into the bay. It’s not too easy to discern in my shadowy pictures but there’s a pile of rubble where the lower entrance would have been and a small opening in the cliff above. 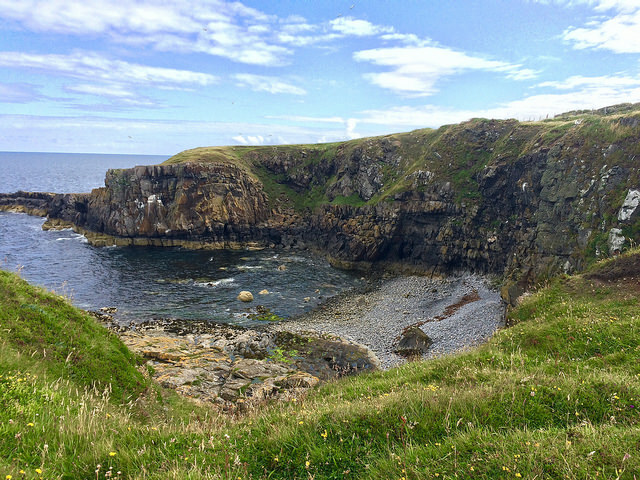 This entry was posted in green places and tagged beach, caves, history, ocean, Scotland, summer. Bookmark the permalink. What a pity it was blown up by the home guard. Do you know why they did that to a bit of Scottish history? There’s a story involving beer, hidden dynamite and an accidental rifle shot, but that may not be true. Possibly they feared it might be used by enemy soldiers? You have the best adventures! And the most scenic. One thing Scotland has in abundance is weather! Oh, the other thing – magnificent scenery! Yes, lots and lots of weather! It looks like a beautiful part of the world – and such a romantic story! It is wonderfully rugged and romantic out there. History, archaeology and natural beauty. Who could ask for more? Thanks for sharing this. Being also a big fan of Lord Pitsligo, it was lovely to see his cave. It’s a shame that you couldn’t explore the cave, but I applaud you for finding it! It’s an interesting bit of history. It is, and a great walk!